Heat oil in a pan and add channadal,urad dal and redchillies. Now add curryleaves and grated beetroot. Now add tamrind,salt and fry well. Cook well until beetroot is done. Cool the mixture and blend it to nice paste with water. Add tadka (Mustard,urad dal,Curryleaves ) to beetroot chutney. Now,yummy beetroot chutney is ready to serve. This yummy South Indian Recipe can be served with all kind of breads. 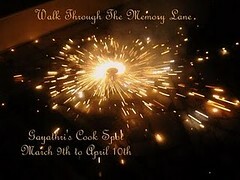 I am sending this Beetroot Chutney to Gayathri's Walking Through Memory Lane Event. 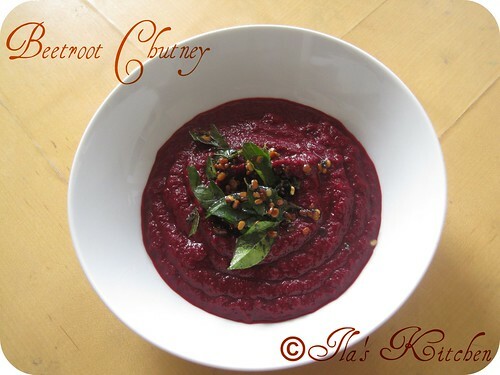 Lovely vibrant color,perfect tempting chutney. Healthy and colourful beetroot cutney. Never had this chutney...looks very vibrant. Chutney look so beautiful and yummy. interesting chutney recipe...looks very tempting and colorful..!! Beet root chutney looks awesome delicious. Love the chutney and the bright color. A very different and colorful chutney..
beetroot chutney !wow...recipe is completely new to me n what an awesome color ! I love beeets.. this a good way to eat some.. Happy to know that we will in the same group of 7 day marathon by srivalli. Yummy and colorful chutney dear,luks gr8! Very colourful and delicious chutney. Thanks for sending..
very new to me !! nice way to use beetroot !! chutney looks so inviting !! Chutney looks colorful and yummy! Very healthy and very colorful. Loved it. 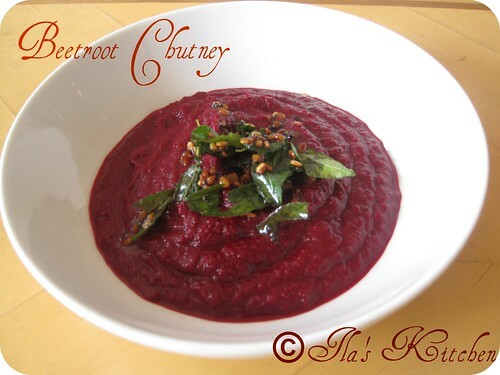 chutney looks colorful.. i like beetroots. haven't tried chutney .. will try this sometime..
Chutney looks inviting!!!! The color is just so attractive!! Lovely color .... nice to know that we will be in the same group of 7 day marathon of srivalli. New and interesting way to sneak beetroot into our meal! i love beets...this looks awesome snd yummy!